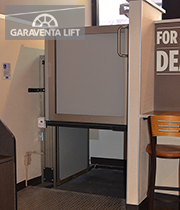 Summary: Another Garaventa Lift located along the popular 16th Street pedestrian mall in downtown Denver. 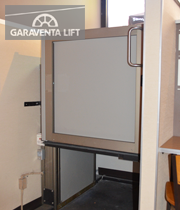 In this case, a Genesis Opal lift is used. 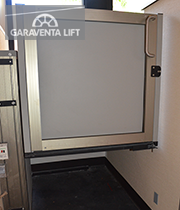 This lift is equipped with a large size platform and a 90 degree on/ off configuration. 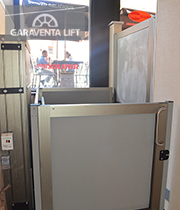 The upper gate features a power operator. 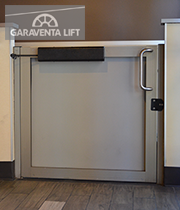 The wheelchair lift is two-tone: champagne anodized aluminum framing and satin gray sheet metal panels. Both were standard colors on the 2011 Opal.